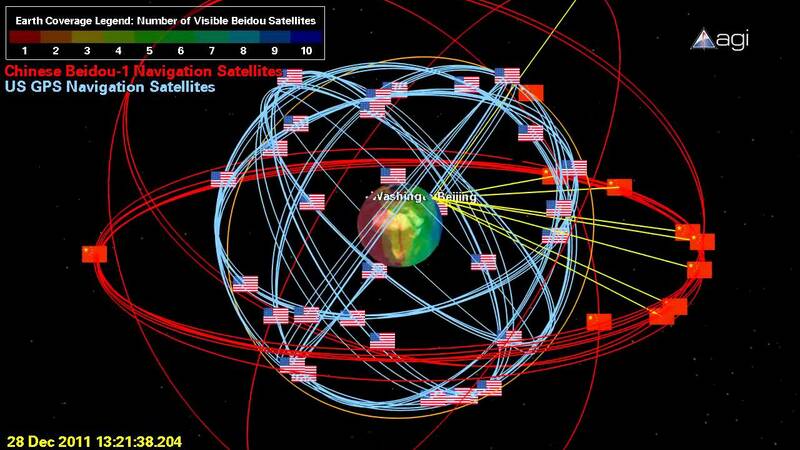 The Beidou-3 navigational satellite system compared to the U.S. GPS. Image Credit: Analytic Graphics Inc. The Chinese National Space Administration is in final preparations to launch another pair of its BeiDou-3 navigation satellites, designated BeiDou-3 M5 and M6, into orbit on Wednesday, June 20. A Long March 3B booster is being readied to send aloft two spacecraft from the Xichang Satellite Launch Center (XSLC), situated in the Sichuan Province. The exact time of the launch has yet to be announced. The mission was initially planned to take to the skies on March 29, however China launched another duo of BeiDou-3 satellites on that day – with the designations M9 and M10. Beijing has not offered any explanations as to why the spacecraft were swapped out. Very little is also know about this upcoming launch. Chinese media have remained silent about pre-launch preparations and about the mission itself. What is known is that the flight should last a few hours as the payload is planned to be delivered into a medium-Earth orbit (MEO). China revealed that the Long March 3B rocket will fly in a configuration with a Yuanzheng-1 (YZ-1) upper stage as was the case with previous BeiDou-3 launches. This stage is expected to ignite its YF-50D engine some 20 minutes after lifting off and should burn out about six hours into the flight, deploying the two spacecraft into MEO. BeiDou-3 M5 and M6 are based on a newly-developed dedicated satellite bus and weigh approximately one metric ton a piece. Both satellites have two deployable solar arrays and were designed to be operational for about 12 years. Once deployed, the duo will offer their services from MEO at an altitude of some 13,360 miles (21,500 kilometers), with an inclination of approximately 55.5 degrees. The passengers of the June 20 mission are part of the BeiDou (BDS) satellite navigation system, named after the Chinese term for the plough or the Big Dipper constellation. The project was formally launched in 1994 and the first BeiDou satellite was launched in 2000. By 2012, a regional network had already begun to take shape, which provided positioning, navigation, timing, and short message services in China and several other Asian countries. BeiDou-3 M5 and M6 satellites represent the third phase of the BDS system (BeiDou-3). If everything goes as it is currently planned, this should be the final stage of the establishment of a Chinese space-based navigational architecture. The constellation should consist of 27 BeiDou-3M satellites in MEO, five BeiDou-3G satellites in a geostationary orbit (GTO), and three BeiDou-3I satellites in an inclined geosynchronous satellite orbit (IGSO). The first BeiDou-3 satellite was launched in March of 2015. Besides M5 and M6, another nine BeiDou-3 navigation satellites are scheduled to be orbited by the end of 2018, according to a state-run Xinhua press agency. “The satellites will provide initial services for countries and regions along the Belt and Road by the end of the year,” said Wang Li, chairman of China Satellite Navigation System Committee. The three-stage Long March 3B rocket that is being readied for the June 20 flight is a 180-foot (55-meter) tall launch vehicle that is capable of sending up to 12 metric tons of payload to low-Earth orbit or 5 metric tons of cargo into GTO. For some launches, this rocket can be equipped with a Yuanzheng-1 upper stage.